The United States has been a leader in human space flight for nearly 50 years and stands poised to make critical decisions about its role in the 21st Century. Will it be a leader or a follower? Will it invest in the research and development that enables space exploration and could also foster the next great economy? Dr. Bonnie Dunbar will feature highlights of her five space flight missions, including scientific and engineering research with the Spacelab and conducting the first docking with the Russian Space Station, MIR. She will review how the lessons learned in developing large space exploration programs may frame our future for returning to the Moon and human exploration of Mars. 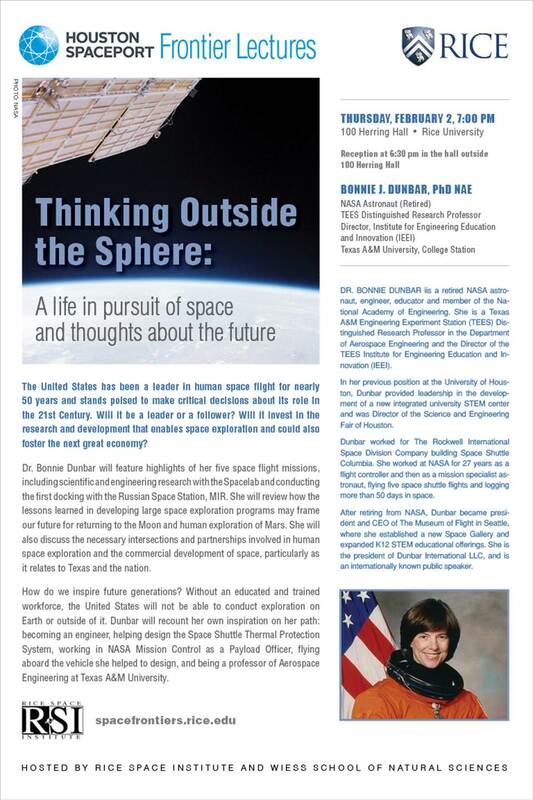 She will also discuss the necessary intersections and partnerships involved in human space exploration and the commercial development of space, particularly as it relates to Texas and the nation. How do we inspire future generations? Without an educated and trained workforce, the United States will not be able to conduct exploration on Earth or outside of it. Dunbar will recount her own inspiration on her path: becoming an engineer, helping design the Space Shuttle Thermal Protection System, working in NASA Mission Control as a Payload Officer, flying aboard the vehicle she helped to design, and being a professor of Aerospace Engineering at Texas A&M University. Dr. Dunbar is a retired NASA astronaut, engineer and educator, currently with Texas A&M Engineering as a Texas A&M Engineering Experiment Station (TEES) Distinguished Research Professor in the Department of Aerospace Engineering. She also has a joint appointment as the Director of the TEES Institute for Engineering Education and Innovation (IEEI). Dunbar, who is a member of the prestigious National Academy of Engineering, came to Texas A&M from the University of Houston where she was an M.D. Anderson Professor of Mechanical Engineering. There she provided leadership in the development of a new integrated university science, technology, engineering and mathematics (STEM) center and was Director of the Science and Engineering Fair of Houston. She also directed the SICSA Space Architecture and Aerospace graduate programs. She has devoted her life to furthering engineering, engineering education, and the pursuit of human space exploration. 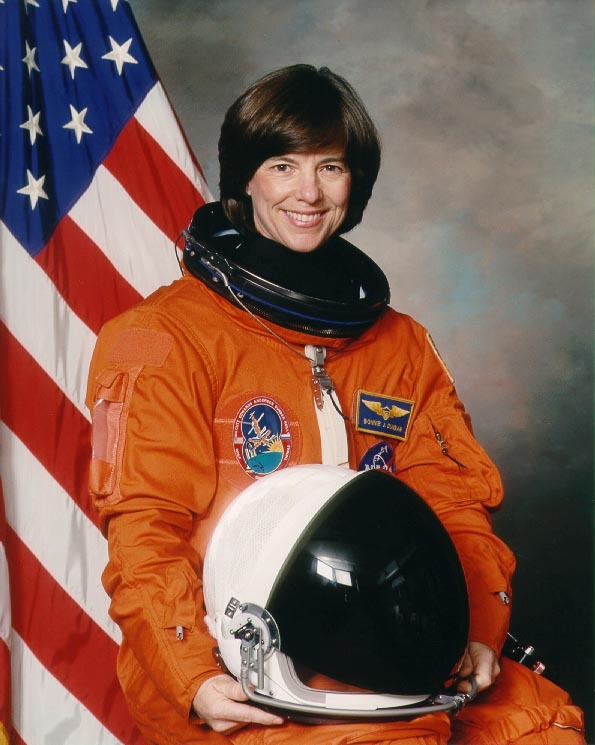 Dunbar worked for The Rockwell International Space Division Company building Space Shuttle Columbia and worked for 27 years at NASA, first as a flight controller; then as a mission specialist astronaut, where she flew five space shuttle flights, logging more than 50 days in space; and then served for 7 years as a member of the Senior Executive Service (SES). Her executive service included assistant NASA JSC director for university research; deputy director for Flight Crew Operations; Associate Director for ISS Mission Operations development, and as NASA headquarters deputy associate administrator for the Office of Life and Microgravity Sciences and Applications (OLMSA). After retiring from NASA, Dunbar became president and CEO of The Museum of Flight in Seattle, where she established a new Space Gallery and expanded its K12 STEM educational offerings. She has also consulted in aerospace and STEM education as the president of Dunbar International LLC, and is an internationally known public speaker. Dunbar holds bachelor and master degrees in ceramic engineering from the University of Washington and a Ph.D. in mechanical/biomedical engineering from the University of Houston. She is a Fellow of the American Ceramic Society, the American Institute of Aeronautics and Astronautics, and the Royal Aeronautical Society. She has been awarded the NASA Space Flight Medal five times, the NASA Exceptional Leadership Medal and the NASA Distinguished Service Medal. Dunbar was inducted into the Royal Society of Edinburgh, and in 2002 was elected to the US National Academy of Engineering. In 2012, she was elected into the ASE international Executive Committee and in 2013 she was selected into the Astronaut Hall of Fame.